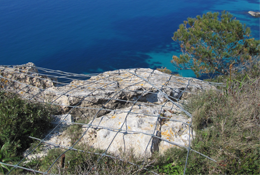 QUAROX® rolled cable net is as robust as a wire rope net and as easy to install as rock protection meshes. 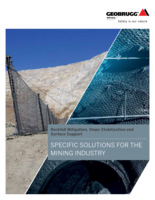 QUAROX® can be applied either as a drape solution or as a nailed active slope stabilization solution. QUAROX® PLUS protects against small-sized but nonetheless hazardous rockfall and is delivered with a secondary mesh, e.g. DELTAX®. Esthetically pleasing: QUAROX® nets do not require the cross clips often visible in traditional cable nets. Chain-link structure: QUAROX® unrolls smoothly and adapts itself to the slope. The nets can be positioned fast and easily. Flexible nail pattern: The standardized roll size of QUAROX® (117 m²) allows a flexible nail pattern, which means less drilling works. Standard rolls: 3.9 m x 30.0 m QUAROX® rolled cable nets are low in weight and easier to unroll during installation compared to traditional 300 x 300 mm cable nets. These ensure that maximum stability is retained right up to the border edges, removing the need for overlap and allowing the mesh and netting to be unrolled easily and independently. Rolled Cable Net 190mm QUAROX® - North America only! Rolled Cable Net 250 mm QUAROX® - North America only!